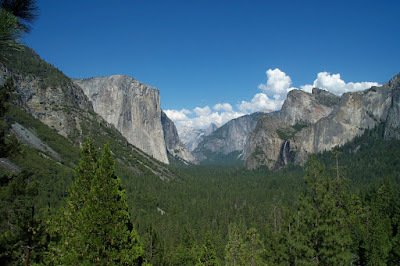 Here's a photo of Yosemite Valley I took last time my dad came to visit from New York. This is your first view of Yosemite, located on the lower western end of the valley as you enter the park. It's breathtaking. You can see the sheer granite face of El Capitan on the left, Cathedral Rocks on the right and just below Bridalveil Falls. Click on image to get a closer look. Most of the granite features of Yosemite Valley were created during the Cretaceous Period when intrusions of igneous rock comprised of solidified molten magna formed plutons beneath the earth's surface. The earliest of these granite intrusions appeared 114 million years ago. Plutons, named after Pluto, the Roman god of the underworld. 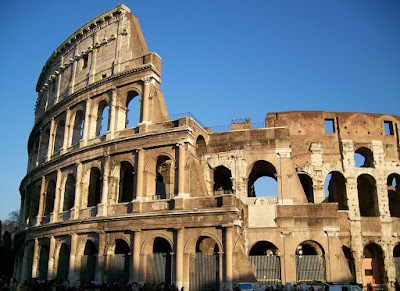 Here is a recent photo of the Roman Colosseum or Coliseum. One of the greatest works of Roman Architecture and the largest amphitheater ever built in the Roman Empire. It's relatively new in comparison to Yosemite Valley, as it was completed in 80 A.D. under the rule of the Roman Emperor Titus. It was capable of seating 50,000 or so spectators for gladiator sports, animal hunts, mock sea battles and executions. Last recorded event was in the 6th century. and another Old/ for old time sake. my contribution Box/Car 2things challenge. 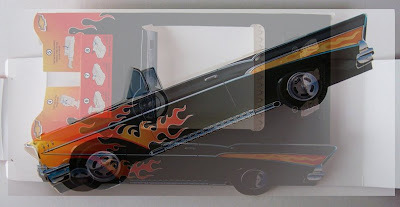 I'm throwing in my image for Box/Car at the request of D.C. Confidential . I thought I was too late last Sunday, so I had deleted it. Might be worth a peek and now it's old. This was actually a folded box car template that once assembled became a carrier for a child's hamburger. Thanks for stopping by! My other blogspot: "The Way I See It"
Great entries, Andrea, you do have to come up with the ideas. I think I would be constantly stumped and have never entered the challenge. Is that a nice old Cadillac you've got in that box? You want to go cruisin', girl? Love your take on old/new. Very different. I know these things take a lot of thought, not as simple as it may seem at times. If only hamburgers came in boxes like that these days! Awesome! Love your old/new. Beautiful photo of Yosemite. I have been to that Coliseum, walked around on top of it. I want to go do it again after seeing your photo! Box/Car is quite interesting also. The overlay of the two works well here. Nice work. Thanks for all of your comments. I always write back, but I don't know if you get my comments back as I cannot seem to get a "subscribe to comments" button on Wordpress. So here goes: as for Scott at Blogger's Choice, I have an update. I'll post it today or tomorrow. Also, it looks like we just need to keep up the pressure. If enough artists write in, I bet a change will occur. Thanks for your wonderful responses to all my posts! I appreciate you, and love your words. We're talking old, old, old with your Old entry! Beautiful picture. I like the way you have made the Coliseum new in comparison. It just goes to show it is all relative. I also love your box/car. It does exactly what it says on the box! I think this is my favorite interpretation this week! At first, I looked at the Coliseum and thought, "New?! Are you kidding?" but then I read on and I thought, "Brilliant!" Both of these photos are stunning. Very well done! Humbling how Yosemite was not built in a million days. Beautiful picture of a wonderful place - covered in snow as we speak. A paradise and a dynamite click of it. The car photo is an original delight - a most happy meal for me on a Monday morn. Very well thought out and executed. Makes me want to listen to a Beach Boys hot rod song. Excellent play on old and new! Both are excellent places to visit. New and old, it is all relative. Is it wrong to covet your entry for old?? I am green with envy. What a looooovely photo! Fantastic building...thankyou for sharing!